Jagdish Bhoi and Rohitnag have been practising organic farming on their five acres of land for six years now in Bhutibahal village of Orissa’s Bargarh district. Earlier, they were using pesticides and fertilizer and getting 25 quintals of rice on an acre of land. But when the price of these chemicals kept soaring every year, they switched to organic farming with desi or indigenous seeds procured from the district seed collector. Production dropped drastically the first year but so did their labour and the cost of production. There were fewer weeds to be removed from the rice fields. But they persisted with organic farming and soon were producing 18 quintals on an acre of land. Like Jagdish, there are some 800 farmers in Padampur block who are now practising organic farming with encouragement and support from Samuhik Marudi Pratikar Udyam Padampur (SMPUP), an ally of ActionAid India working towards empowering communities to access their rights over land, water, forests and other commons; advocating for their participation in public welfare schemes; restoring rights of women and girls, and ensuring their safety; and advocating for providing them with equal socioeconomic opportunities. But the shift to organic farming was not very easy and the biggest barrier was the lack of a seed bank. 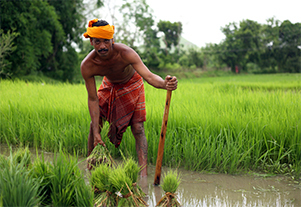 Each farmer was then encouraged to preserve three or four variety of desi seeds. Women are encouraged to come forward and take on the responsibility of “seed keepers” in their villages. Seed farmers are honoured during the seed festival and children participate in discussions and debates on desi seeds. Bottles of organic pesticides, locally prepared, are displayed with the same pride as the seeds. Organic rice is uneven in size and its reddish colouring makes it unattractive for those who are used to long grained, white rice. However, diabetics who are not permitted to have white rice can have the desi red rice. Another important benefit of organic farming is that the soil retains its fertility. A thousand farmers of Gaisilat area are into organic farming and seed collection. Many farmers, however, are on the cusp, doing a mix of organic and modern farming on separate plots. As the farmers of Padampur, Paikmal, Gaisilat and Jharbandh march towards sustainable agriculture, there are 134 compost pits in eight villages and 50 vermi compost pits in 12 villages. In all 107 villages, kitchen gardens have been promoted and 118 farmers trained in natural farming with support of SMPUP.